Move those AT guns along, folks. The Germans will move! Villiers-le-Sec, East of Bayeux: June 7th, 1944.The German 352. Infanterie Division was deployed to the west and south of the Gold landings. General Kraiss 352nd's commander was afraid that if British tanks got loose, they could turn west and roll up his divisional sector from the rear. The division's reserve kampfgruppe consisted of the 915. Infanterie Regiment as well as the divisional Fusilier Battalion. Oberst Leutenant Meyer commanding the kampfgruppe was ordered to move to Villiers le Sec in company with some StuG's and attack towards Crepon. Things did not go as planned, the 1st Battalion was diverted to support the Omaha beach defences while the remainder of the kampfgruppe was harassed and delayed by Allied fighter bombers. Before Meyer's men could deploy, units of 69th Infantry Brigade with the 4th/7th Royal Dragoon Guards had closed and a stiff battle began. 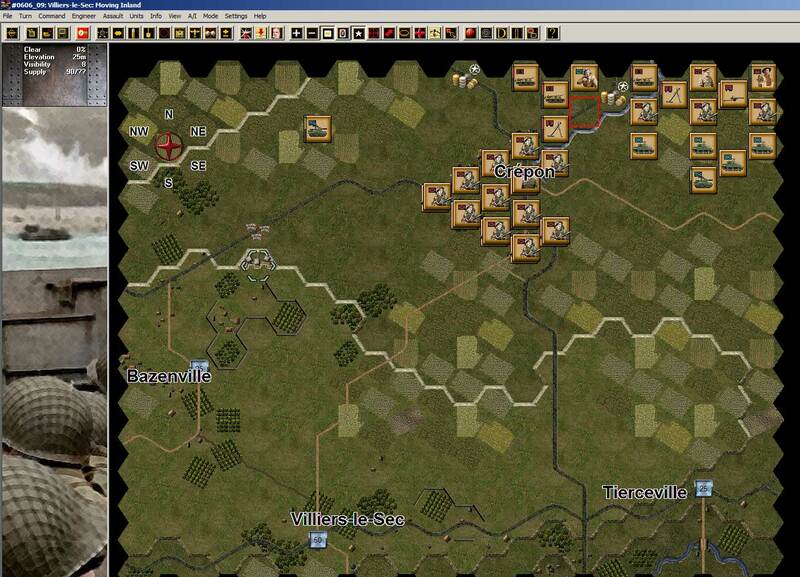 I am playing this scenario solo, in command of the UK forces. It's developing as a classic "revolving door" battle, with both forces' center of mass orbiting the center of the battlefield. It usually happens when both forces try hard to outflank each other (for more details check out this book). Except that in this case, I am attacking and leaning my forces on the east flank and part of the enemy (352 Infantry Division) is moving north towards Crepon and leaning on the west flank (i.e. no wide flanking intended by neither side). 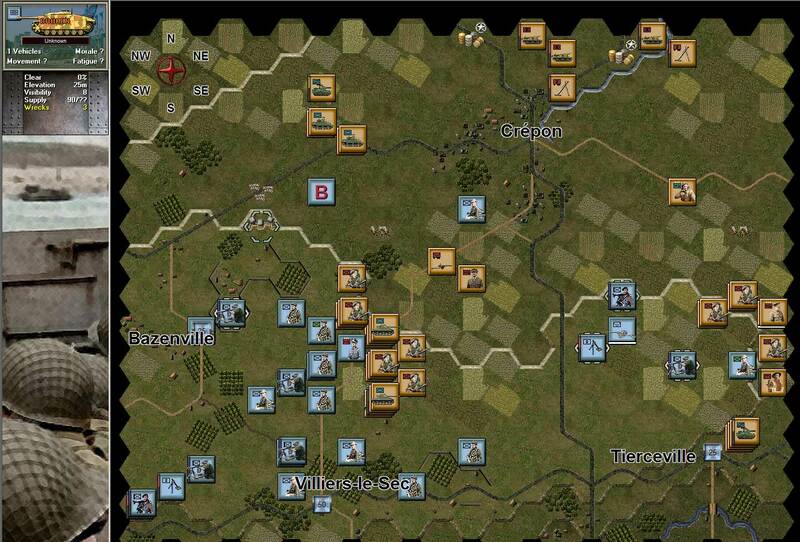 My center is the 7th Green Howards Battalion, reinforced with a share of Sherman tanks from the 4-7th Dragoon Guards. 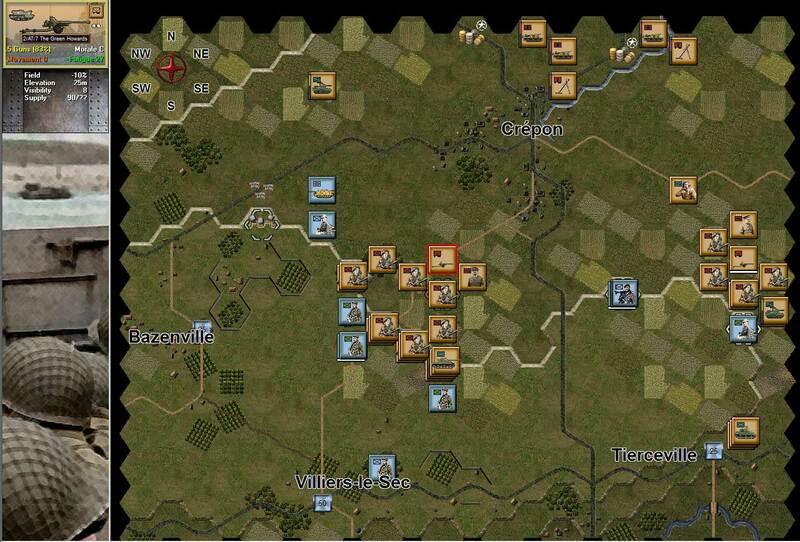 With relative ease, they already advanced 1 km or so, when they first spotted 4 German StuGIIIs plus some infantry. There goes my west flank, I thought. In the center of the screenshot, the 7th Green Howards Battalion is moving towards Villers le Sec, when the enemy infantry armor team appeared in the west. The AT gun, which was catching up with the rest of the Green Howards came very handy to stop the enemy attack. With the arrival of a very much needed armor reinforcement, the StuGIIIs were reduced to burning wrecks. The icon with the "B" label is for a broken unit. 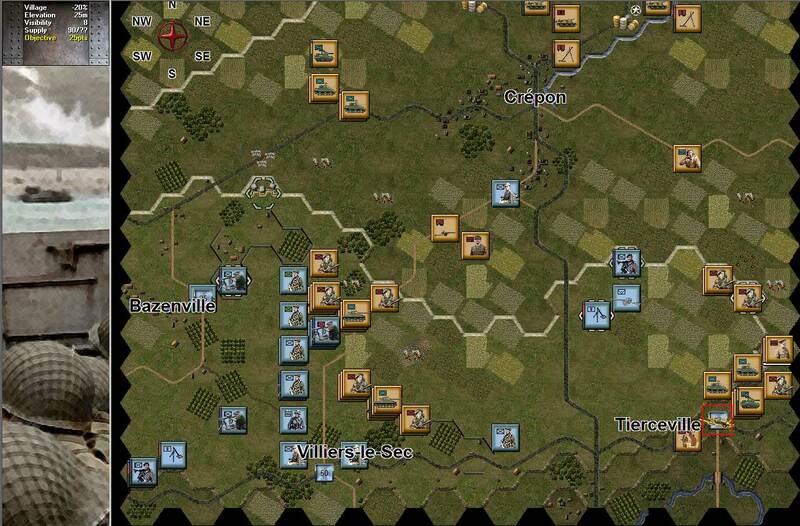 Note my flanking maneuver on the east flank, with my forces already near Tierceville. Half an hour later, the enemy has halted its attempt to take Crepon and I am continuing my advance towards the objectives. Note to myself: keep those AT guns moving forward. Are you playing against AI? I like the looks of this game. I have never bought a John Tiller game, but this one looks very interesting. H Gilmer from Matrix Forums. Oops Never mind, I see you said you are playing solo. Hi H. and thanks for dropping by. It is a great war game. I am sure you will like it.